After a bikini laden day of white sand beaches and Senor Frogs happy hour frozen cocktails, every Cancun visitor should head to the lesser known, yet equally enjoyable, “Palapas Market”. Located just a few blocks from the main bus terminal, a line of non-descrip food stalls extend the length of a small town square. Attracting far more locals then tourists each stall sells their rendition of the same fare - tacos, tostadas, burritos – but only one sells my favorite (and what will surely be yours)…EMPANADAS! Half-moons of dough filled with your choice of classic pollo (chicken), carne (beef), or the more exotic, carnitas (shredded beef) and chicharron (pork fat). Dropped into a bubbling vat of oil, the empanadas emerge moments later glistening with fried goodness. A variety of Mexican cheeses are piled on top and their a creamy white secret sauce drizzled over everything. Already an edible masterpiece the meals crowned jewels are still to come. Spicy habaneros, green tomatoes, red chili sauce and diced pink onions. One crispy, hunger satisfying empanada can be yours for 12 pesos, or, $1 USD. As for the food stall name…your guess is as good as mine. Who needs a name, when you have all the business anyways? Just head to the very first stall, the one with a long line of hungry, salivating locals, and prepare to be edibly amazed. Our favorite place, Naru’s Tacos, lies only a few roads back from the main strip yet rarely see’s a tourists face. A basic shack with a few rustic tables, plastic tablecloths and plastic stools serves up great Belizean food both morning and at night. In the morning, 3 tacos for 1 Belize dollar or .50 cents. Or, try the Fly Jack. A large piece of fried dough folded over and filled with marinated chicken or ham. A spicy habanero sauce set on the tables must be made fresh daily because as the day goes by, the sauce grows spicier. Another great treat, juices. Banana, papaya and watermelon juices served ice-cold keep the spice at bay. Go ahead and indulge, Naru-style! dining at western-style prices with double the western prices. off the beaten track, cheap eats can be found! Belize is a nation of fusion. Many cultures and cuisines merging over the years to create what is now considered their national dish - rice, beans, stewed chicken and plantains. Caye Caulker is noticeably cheaper then its aforementioned big sister, Ambergis Caye, but just because the prices drop at western restaurants, doesn’t mean you should dine there. Check out Martina’s! A small shack tucked off the main street and recognized by small wooden awning and lone, splintered picnic table. The menu is simple: Stewed Chicken, Rice, Beans and Plantains but for 7 Belize Dollars (3.50 USD) the feed will keep you coming back for more!!! Stewed for hours in a spicy jerk seasoning the chicken practically melts off the bone before reaching your anxious lips. The rice, well it’s rice, but the addition of beans simmered in pork fat bring the amalgamation to life. Creamy coleslaw balances the heat and lest we forget the sweet, oh so yummy, plantains. Not quite a dessert but too sweet to be a main, they are the perfect compliment to a deeply savory feed. A Caye Caulker legend himself, the old man running the shop wears years of food service on his tired face, but it only takes a simple compliment to light up his weathered face. Another Caye Caulker legend, located next to the main pier, is the ONE, the ONLY, "Budgetman" - A vibrant, middle-aged Rastafarian man, who serves delectable meals from noon until…well, it runs out (usually a quick 2 or 3 hours). He claims to cook something new everyday and that you would have to stay on Caye Caulker for at least 15 days before tasting a similar meal. Serving from giant cast iron pots, “The Budgetman” ladles gaping amounts of his perfectly balanced fare into large, beach ready, take-away containers. Our meal, succulent lobster simmered in a buttery garlic sauce, was accompanied by curried vegetables, saffron seasoned rice, candied plantains and a homemade spicy habanero sauce. It was drool worthy, lip smacking, finger lickin' delicious! And although the meal was at the top of our cheap backpacker budget (15 Belize per plate - $7.50 USD) it was a worthwhile splurge! 4. "Yo Quiero Taco Stop!" Mexican by origin, this small shack serves up belly bursting burritos, quesadilla’s, and as the name would suggest, tacos! Marinated chicken, savory pastor, tender carne or fresh fish grilled to life right before your eyes and served with a selection of sauces. Spicy chili, smoky chipotle and a sweet & savory house secret all designed to elevate your taco to the next level. And tacos are only the beginning! My favorite dish of all...QUESADILLA'S!! Same moving parts as the tacos but a different packaging all together. Sealed between two flour tortillas all the meats, cheeses and sauces melt into one explosive molten center while the crisp, steamy crust keep Mexican Vesuvius from erupting. And the price? How about 3 tacos, or one oversized quesadilla, for a buck! "Yo quiero Taco Bell?" More like, "Yo quiero Taco Stop!" Whether returning from a big day’s surf, an epic night out, or when in need of a greasy hangover remedy, the Taco Stop is always on call. 5. You say Tomato, I say Tostada! A stunning dome-shaped island, set against a sparkling blue lake, the town of Flores has more then just beauty to offer, it has TOSTADA’s! Follow your nose upwards. Climbing the weathered cobblestone streets to the island apex, a charming city park awaits. Boasting a brilliant ivory cathedral, flowered trellises, perpetually occupied, park benches and 360-degree views of the lake below, the only thing that could possibly make the scene better are three battered, tin-roof, shacks flanking its eastern side. Beckoning church go-ers, young lovers, and hungry tourists alike, an array of savory snacks beg to be sampled. Don't be tempted by other fare, head straight for the middle stand and order the unbeatable, unforgettable, crunchy, crispy Tostadas ala Flores. Your choice of onion and chili marinated beef, chicken, or pork are first grilled to perfection on a fiery, oversized hotplate. 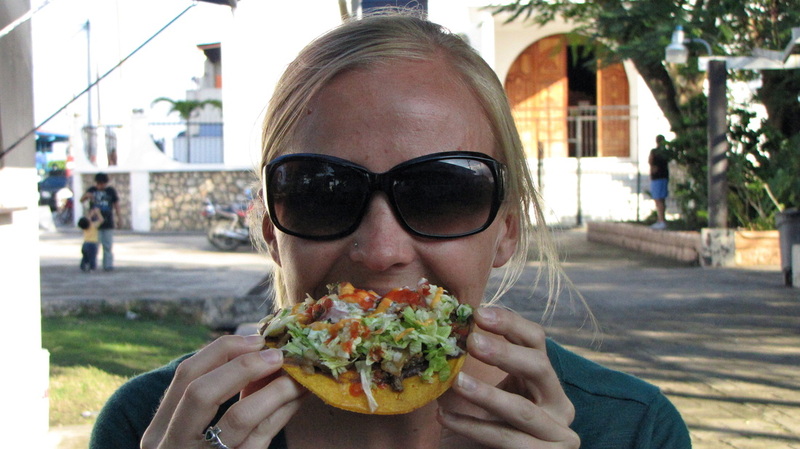 The chef next reaches for a warmed tostada shell and slathers a salty refried bean paste from edge to edge. The final step is all about layering. Adding the tenderly spiced meat, crisp lettuce, homemade pico de gallo, creamy avocado and finally, and I can’t believe I’m admitting this, CHEEZE WHIZ. Something about that whiz just elevates the tostada from good to great! Two tostada's with a frosty banana shake for 1.50 USD (10 Quetzales), oh yeah, this meal easily clenches Guatemala’s best cheap eat! 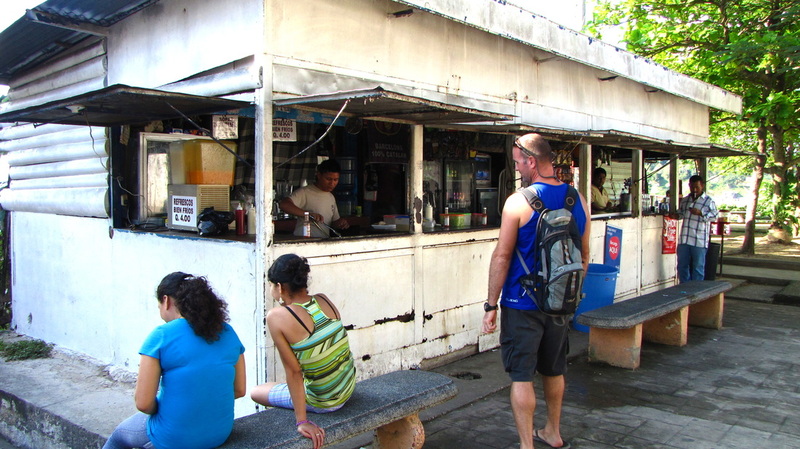 Papusa’s seem to have a love/hate relationship with many El Salvador travelers. Some swear by them, others stomachs churn at the thought of them. I luckily, had no such case of “backpackers belly” or “papusa poo’s” and therefore can only rave about these simple delights. From first glance, papusa’s resemble Greek Pita’s. Round, golden brown and thick. But unlike pita’s where fillings are piled inside, papusa fillings are blended into the batter. Beginning with a dense, maize flour dough, mixtures of shredded pork (chicharron), refried beans and a variety of cheeses are folded in. Once all the ingredients are incorporated, the dough is rolled into dozens of golf ball size spheres, flattened and placed on a screaming hot griddle. Almost immediately, the papusa poofs up against the heat and only needs a few minutes and a few quick flips to complete the cooking process. With a piping hot papusa now in front of you, you are left with two choices. Spicy red sauce or the the mystery pot, otherwise known as, "curtido" - a mixture of jalpapenos, vinegar and fermented cabbage carrot slaw (trust me, it’s much better then it sounds). I choose...well, both! The final meal addition, a drink. Or in this case, a milkshake. A frosty cold, fishbowl-size, chocolate banana shake clenches the win for El Salvador’s #1 dish...PAPUSA'S!! !